← Is George Lucas Right To Retire From Blockbusters? It’s being reported today on The Hollywood Reporter that the three stars of The Hangover movie series, Bradley Cooper, Ed Helms and Zach Galifianakis, are demanding a $15m day payday, each, to make a third Hangover movie. This reeks of greed, the stars in question appearing as mercenaries. The movie series has made the careers of all three. Cooper and Galifianakis had enjoyed some success before the first movie, granted. But it really was its huge success that brought them to a wide audience, and created their great demand. Do they not therefore owe it to everyone involved to just get on and make the movie at a reasonable rate? It’s not as easy a question to answer as you might think. There are two sides to every battle, and in this case, both sides have strong positions. Bradley Cooper’s career has exploded in the last few years, and he is named in the frame for seemingly every proposed project, with his classic Hollywood looks, and solid acting ability. Make no mistake; The Hangover Part 3 needs Cooper far more than he needs it. The same cannot, however, be said about the other two leads. Galifianakis has had a solid career, but he is much more of a supporting player, or character actor, than he is a lead. With his unorthodox look and comedy sensibilities, his opportunities will continue to be limited, and he is perhaps unlikely to play such a big part in such a financially successful movie series again. He will continue to have a successful career beyond The Hangover, but may never find himself in a position to name his price again once the sun has set on the series. This is all amplified for Ed Helms. He has had a successful TV career, but never as a leading character, and has only played bit parts in the movies he has appeared in. Even the successes of the two Hangover movies have so far failed to improve his filmography. He has a very generic look, and is not destined for the same Hollywood success as Cooper. Once The Hangover is done and dusted, he is most likely to be back to a career on television. In short, The Hangover is the biggest thing to happen to him career wise, and he’d be well advised to make the most of it. All three actors are standing together to present a united front, despite their very differing stakes in another Hangover being made. Cooper could take or leave it, Galifianakis wouldn’t be lost without it, and Helms must have his fingers crossed it goes ahead. Are they really worth a collective $45m though? Under normal circumstances, no. Even with Cooper’s career surge, it is a lot of money. I cannot see either of the other two actors ever being offered that much for another project their entire careers. They are, however, probably worth that much to this franchise. A lot is being made of the fact that the first Hangover movie only cost $35m to make, and that it would be ridiculous to pay more than this just for the three principal actors next time around. I think it is the relatively low production budget that works for them however. The first Hangover grossed nearly $467m worldwide. That’s $432m more than its production budget. The second movie was more expensive, going the ‘same but bigger route’, but even at $80m, it enjoyed a bigger worldwide gross around $581m, that’s a difference of over $500m. Why shouldn’t the actors be cut in more on such a huge profit? The costs are increasing, but so are the takings, so at the current rate, there’s room for $45m to go to the talent. The films are not expensive to make, and certainly don’t seem difficult to write, if the same formula is going to be repeated again and again. It is the stars as much as the writing or direction that have made the movies so popular, and $45m out of the profits for a third movie would still be better for the studio than no third movie at all. One thing to consider though, from the studio’s point of view, is whether a third movie will still be able to draw in the crowds. The first was a sleeper hit, and the second traded in on the first movies popularity, without introducing anything new. 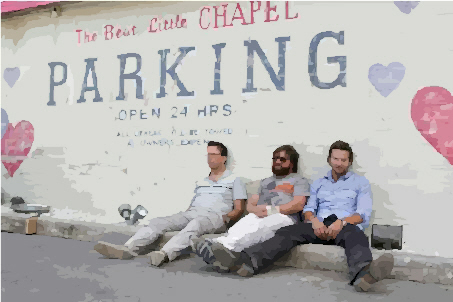 The Hangover Part Two was more like The Hangover 1.5, and fans of the series may now be somewhat jaded as a result. The formula will be pretty tired by the time Part Three hits, and it may well be that movie goers will decide to give it a miss. There are rumours that a third film would not stick so rigidly to the same formula, but it seems unlikely that existing fans of the series would be overly interested in a dramatic character piece. Part Two was a sure fire hit, but as a result of laziness, Part Three has become a gamble. That gamble probably looked like one worth taking, but if the studio factor in an extra $45m of expense, the risk is going to loom a lot more ominously. With Harry Potter and Batman winding up this year, though, Warner Bros slate is looking a little sparse for 2013, when The Hangover Part Three would be most likely released. All things considered, Warner Bros will most likely go for it, and can have no real arguments over the star’s demands. It isn’t as though the actors are likely to receive a lot of prestige from the film, and as discussed earlier, it could well do Bradley Cooper’s career more harm than good. He has a lot of irons in a lot of fires, and the time taken to make another Hangover movie can be seen, from his perspective, as time lost. It’s no wonder he wants to get well paid to do it, and he’ll be doing both the studio, and his fellow actors, a favour if he does it. The bigger question, for me, is if anyone really cares. I think a lot of the fans of the series felt let down by Part Two, and the next film will most likely be the final nail in the series’ coffin, one way or another. What do you think? Do you want another Hangover movie? Should the star’s demands be met? This entry was posted in Articles, News and tagged Bradley cooper, budget, casting, news, part three, salary, the hangover, warner bros. Bookmark the permalink. Honestly, the trailer for part 3 would have to impress me beyond belief to get me to the theater to see it. I absolutely loved the the first one, but loathed the second one. I don’t think they can capture lightning in a bottle twice with this franchise and they shouldn’t try. I enjoyed the first film, but I haven’t seen the second one yet. I’ve heard it is just a repeat of the first film in a different locale, which, of course, it would be. I don’t see how anything fresh can be done in a third installment. So, I’m saying “yes” for Bradley Cooper, and “no” for the other two actors. Based on this, wouldn’t The Three Stooges or The Marx Brothers have an estate in the BILLIONS! Very well written article. Frankly, I think they shouldn’t make the third part. I loved the first movie but the second one was meh. Thats why I think the 3rd one will be worse. The first one was good because it was original. The second one was less good because it was a copy of the first and the 3rd one could be really bad if they’ll make it as a copy of a copy.